Drawing in pen-and-ink and watercolour made by Colesworthy Grant in 1855, depicting a view of a tomb thought to belong to an Englishwoman on Negrais (Hainggyi) Island in Irrawaddy (Ayeyarwady) Division, Burma (Myanmar). The drawing is from an album of 106 landscapes and portraits of Burmese and Europeans entitled, "A Series of Views in Burmah taken during Major Phayre’s Mission to the Court of Ava in 1855". The album documents the British embassy to the Burmese King, Mindon Min (reigned 1853-1878), which started from Rangoon and travelled up the Irrawaddy River to the royal capital of Amarapura in central Burma. Negrais Island was not visited on this journey as it is situated on the southern coast of Burma at the mouth of the Bassein River. However it had significant historical associations for the British. In 1753 the East India Company had erected a factory on the island to form a settlement and a treaty was obtained from King Alaungpaya, ceding the island to the British in perpetuity. In 1759 the settlement was attacked by the Burmese, the members of its garrison either killed or taken prisoner, and the factory subsequently abandoned. Describing this image, the artist wrote of “A dilapidated Tomb - said to have covered the grave of an English lady, buried in this spot about one hundred years ago. 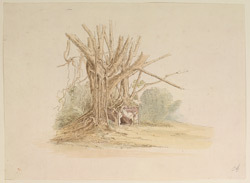 The tomb is enwrapped in the arms and roots of an old Banyan tree.” Grant (1813-1880) accompanied the mission to Ava as official artist along with the photographer Linnaeus Tripe. He had come to India in 1832 where he lived in Calcutta and worked as a professional artist and freelance journalist, travelling to Rangoon in 1846.